Yoga’s roots are in ancient India. The word “yoga” is usually translated to mean “union,” and yoga’s focus is on unifying the mind, body, and spirit. Yoga’s main goal is a spiritual one — to help individuals achieve true happiness, freedom, or enlightenment. But yoga also has several secondary goals, such as improving physical health and boosting mental and emotional well-being. It is usually these secondary goals that are the focus of yoga practice in the West. The emphasis is on poses, moving sequences, and breathing practices, as well as deep relaxation and concentration. Like any tradition that has been around for thousands of years, yoga has evolved over time. Today, there are many different styles of yoga. Some are continuous and flowing, some are strenuous, and others are gentle and contemplative. Certain classes concentrate on proper alignment of poses, while some emphasize relaxation, and some have a more spiritual focus. Medical research has shown that yoga can have several physical and psychological benefits, including increased strength, flexibility, balance and a greater ability to relax and manage stress. Yoga can help people to breathe more efficiently, and reduce anxiety or depression, while improving positive feelings, increasing energy, and reduce the symptoms of many chronic disorders. Can yoga help people with arthritis? Physical activity is recommended as part of comprehensive treatment for all people with arthritis. Exercise is beneficial for most people, but it is especially important for those with arthritis, who often have decreased muscle strength, energy, and endurance. Exercise does not increase joint pain or make the arthritis worse, and it may play a key role in promoting joint health. More than 100 scientific studies on yoga have been published in major medical journals. These studies have shown that yoga is a safe and effective way to increase physical activity that can also offer important psychological benefits because of its meditative nature. These physical and psychological benefits may be especially helpful for people living with a chronic condition such as arthritis. Only a handful of studies have looked at the effect of yoga specifically on people with arthritis (though several more are underway). However, these early studies have shown that yoga can bring about some improvement in joint health, physical functioning, and mental and emotional health. Perhaps most important is that yoga can affect quality of life for the better. For people who don’t like traditional forms of exercise such as aerobics or water exercise, yoga offers an enjoyable alternative. It’s also a good way to help reduce the stress and frustration that pain and disability cause and to increase positive feelings and well-being. Studies suggest that people with arthritis may enjoy yoga more than other forms of exercise, which means they might tend to stick with it longer. How can I find yoga that is safe for me? Yoga seems to be everywhere these days. It is likely that you’ve spotted yoga books in your bookstore, yoga videos in the video rental store, and yoga classes at every community center and fitness center in your neighborhood. And while they all have their place, the safest way to start practicing yoga is at a yoga studio with a well-trained and experienced yoga teacher. Look for yoga teachers who are registered with Yoga Alliance, and ideally trained with Yoga for Arthritis also. You can search our website to locate the nearest Yoga for Arthritis Teacher in your location. Yoga for Arthritis Teachers have undergone a 30-hour intensive which includes advanced skills and knowledge about how to safely teach yoga for people with arthritis. Our certified teachers and teacher trainers have also attended 20 more hours of advanced training, and have at least one year of experience working with students who have arthritis. Ideally, your instructor should have experience with people with arthritis or other mobility restrictions. This article covers how to choose an instructor if you can't find a YFA instructor in your area. A small class size will ensure that you get enough individual attention, and starting with a beginner or gentle class is essential. Once you are familiar with the basics and have received proper guidance about modifications to protect your joints, you may want to supplement classes with home practice, using books or videos. We collaborated with the Arthritis Foundation on a DVD called Arthritis-Friendly Yoga (see below), which you might find helpful. There are also some styles of yoga that are more suitable for people with arthritis. These include Sivananda and Integral yoga, which are gentle styles, and Iyengar and Anusara yoga, which emphasize alignment. Yoga that is taught at a quick pace, in a hot room, or with advanced poses (such as Vinyasa, Bikram, or Ashtanga yoga) is not recommended. Some locations also offer special yoga classes, such as chair yoga, yoga for seniors, or even prenatal yoga, that are gentler on arthritic joints. It is a good idea to contact your local yoga studio to find out more about the types of classes that are offered. Often, facility staff will be able to recommend the class that would be most suitable for you. You should wear comfortable clothing for yoga, but it is not necessary to buy special yoga clothes. Anything that allows you to move, such as shorts or sweats and a T-shirt, should be fine. You may get warm or cold during different parts of the class, so wearing layers or having socks with you is a good idea. (Yoga is practiced barefoot.) It is also important to have a water bottle so you can stay hydrated during the class. 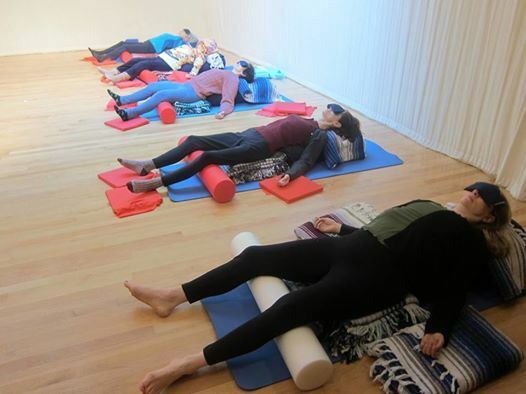 Some facilities have yoga supplies for your use, such as mats, blocks, straps, or blankets. You should ask ahead of time whether you are required to bring your own mat or props to class. Blocks, wedges, and other props can be particularly helpful for protecting arthritic joints and accommodating any movement limitations you may have. You can buy yoga supplies at most sporting goods stores, or on our website. Should I talk to my doctor and my instructor first? Absolutely! As with all physical activity, it is important to speak with your rheumatologist and/or primary care doctor to make sure that it is safe to begin exercising. Many doctors may be unfamiliar with yoga, but you can assure your doctor that you will be taking a gentle beginner class, and that you will receive proper guidance from a qualified instructor. On our website, you can find a printable page for clinicians, and you may want to take this to your next medical visit. If yoga is not suitable for you right now, your doctor may be able to suggest other activities that can keep you active and help improve your overall quality of life. What if I am having a flare? Despite typical misconceptions, exercise does not cause a flare. Exercise can help reduce pain if done gently and safely. Actually immobility or spending the day in bed may prolong the duration of the flare. Modification of your usual routine is best and continue to move the joint slowly and gently if possible. Allow for periods of rest with lighter activity during the flare then gradually increase range as your joints permit. Whether you are having a flare or not, never push your body to the point of pain. Skip or modify your movement or poses that aggravate or increase pain in any particular joint. Pay close attention to pain that continues after your practice. Anything more than mild muscle pain should be discussed with your doctor. Always consult your yoga teacher and your doctor if you have questions or concerns. If yoga can be done by chronic disease patients, does that mean it is safe for anyone to do?